Contact Miami-Dade County Truck Accident Attorneys Gerson & Schwartz, P.A. Gerson & Schwartz, PA represent clients seriously injured in auto, truck and motor vehicle accidents due to the negligent acts of third parties. Under Florida Statutes 320.01, a "motor vehicle" is defined as any vehicle operated on a public road way (other than by human power) that transports persons or property. Uniform traffic laws are applicable to all who operate motor vehicles on streets and public road ways. Every driver on the road has a legal duty to operate their vehicle with reasonable care and in a way that does not put other drivers and passengers at risk of injury. Unfortunately, people drive negligently every day and cause thousands of auto accidents, which in turn can cause serious personal injuries. Injuries from auto accidents can be severe, may require expensive medical treatment and rehabilitation, and have a significant impact on your life. Gerson & Schwartz, PA is dedicated to helping Florida auto accident victims receive compensation for their injuries. Over the last 43 years, our firm has represented clients injured in virtually every motor vehicle accident scenario. From routine motor vehicle crash cases, to accidents with commercial vehicles, taxi cab accidents, motorcycle accidents, rental car accidents, school bus accidents, truck accidents, even scooter and ATV accident cases. Our law firm also handles complex injury cases such as hit and runs, pedestrians accidents, bicycle accidents to catastrophically injured and wrongful death claims. Our firm uses all potential resources available so our client's legal interests are protected. Our job is to prove in a court of law the amount of financial compensation necessary to adequately compensate our client's for the harms and losses they have endured. We utilize experienced investigators and conduct thorough background checks as part of our due diligence. We employ leading expert witnesses in relevant practice areas from accident reconstruction and other medical specialties to help prove our clients cases. Our goal is the same in each case. That is to ensure that all responsible parties are brought to justice for the serious harms and consequences our clients face. Finding a qualified law firm that specializes in auto accident cases important for a number of reasons. In serious injury cases such as a closed head or traumatic brain injury there are numerous medical bills and high costs associated with hospitalization and medical treatment. Therefore, uncovering all potential sources of legal and financial responsibility must be carefully investigated. Our law firm has over 70 years of collective experience litigating personal injury claims in Florida. The attorneys at our law firm have tried over 300 plus jury trials. We have the experience and proven track record of case results to prove the job that we do. Our firm uses all potential resources available so our client's legal interests are protected. We are located in Miami, Florida between downtown Miami and Coral Gables, Florida. Our location makes it easy for clients to schedule appointments and case consultations. Our Miami motor vehicle accident attorneys also represent clients in serious and catastrophic injury cases such as accidents with drunk drivers. We are experienced Florida trial lawyers and have been successfully representing injured victims and their families throughout South Florida since 1970. When people think of auto accidents, they usually imagine a collision between two smaller passenger vehicles. However, this is only one kind of accident that occurs on Florida's roads and highways. Accidents also often involve motorcycles, large semi-trucks, and even pedestrians, to name a few. Collisions can also vary from a simple rear-end collision to frightening rollover accidents. The resulting injuries can range from a mild case of whiplash to complete paralysis, amputation, or serious burns. No two accidents are alike, and therefore proving the other drivers negligence requires hard work, and a careful investigation of evidence in each unique case. Injuries from motor vehicle accidents can vary widely in location, type, and severity. Some injuries may not even be realized until well after the accident, though you will still be required to prove that the accident was the true cause of your injuries. No matter how mild or serious their injuries, auto accident victims are entitled to recover if the other driver was negligent. Negligence on the road comes in many forms. One of the most common occurrences of negligent driving in this day and age is distracted driving. Distracted driving is usually due to using a cell phone to text, email, or simply place a call. Florida law recently banned texting and driving, however people continue to text and drive on a regular basis. Also, texting while driving is only a secondary offense, meaning the driver would have to be pulled over for another reason to be cited for texting. Whether or not the driver is cited criminally for texting, an accident victim can still hold the distracted driver liable in civil court. Other common negligent driving practices include drunk driving, speeding, following too closely, running red lights, and other forms of aggressive driving. Drivers are also required to pay attention to pedestrians and honor their right-of-way when appropriate. Failure to properly maintain a vehicle can result in defective car parts, and can cause a driver to lose control of their car and cause an accident. Drivers of large trucks have numerous other factors that commonly contribute to accidents, such as fatigued driving and improper cargo loading. After an accident you may find yourself overwhelmed with phone calls, and correspondence from insurance companies, health care providers, hospitals, medical bill collectors sometimes collection agencies. We deal with these companies so our clients can focus on receiving the medical care and treatment they need so they can get back on their feet. After a motor vehicle collision insurance adjusters often try to contact injured victims before they have an opportunity to speak with an attorney. These are common insurance company tactics. Insurance adjustors want to get as much information from you as early on as possible. They may ask to take your statement or may try to settle your case early on knowing that you have yet to discuss the case with a lawyer. We recommend that all accident victims in South Florida speak to Miami, Florida auto accident attorney before you speak to any insurance company representative. If you are injured in any kind of motor vehicle accident, you may incur several types of medical bills, including emergency services, surgeries, hospital stays, rehabilitation or therapy costs, and doctors visits, and you may face years of necessary medical care in the future. You are entitled to reimbursement of all medical costs by the negligent driver. Injured victims are also entitled to financial compensation for their lost wages, loss of earning capacity, loss of capacity to enjoy life, and for permanent injuries such as scarring, disfigurement, and loss of bodily function. If you are married, you may be entitled to receive compensation for the loss of society, support, and services of a loved one. If you have been injured, it is imperative that you consult with an attorney who has auto accident claim experience as soon as you can. Our attorneys will guide you through the entire process of filing your claim, so that you have the best chance of receiving fair compensation. After an accident you should seek immediate medical care so you can get proper medical treatment and document that you have been injured. New changes under Florida's motor vehicle laws also referred to as "No Fault Benefits" or "Personal Injury Protection"(PIP) commonly heard on the radio and attorney referral services have recently been enacted. Insurance companies may try to use any delay or "gap" in your medical treatment to argue they should not have to pay the full value of your claim. Failure to seek prompt medical attention by a physician can also have an adverse affect on the merits of your claim in the eyes of a claims adjustor. Injured victims in motor vehicle collisions must seek medical attention within (14) days of an accident. If not, you may jeopardize the amount of no fault benefits available under your own auto insurance policy. Our legal staff is here to explain how recent changes under Florida motor vehicle accident laws may apply to your specific situation. Furthermore, our attorneys know how to apply Florida's new motor vehicle laws regarding Personal Injury Protection (PIP) insurance to each individual case, and to use the law to your advantage. What do if Injured in an Auto Accident? Our legal staff is waiting for your call and our attorneys are available to answer questions about your case. We try to response to all new email inquiries in 24 hours or less. By hiring a reputable law firm will help ensure that full amount of your damages are recovered. 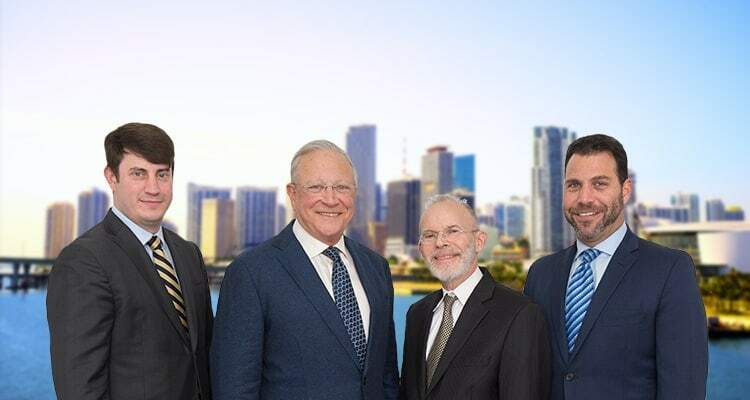 If you or a loved one has been injured in an auto accident in Miami Dade, Miami Beach, Coral Gables, Fort Lauderdale, or another area in South Florida contact Gerson & Schwartz, PA for a free case consultation. In Miami-Dade call us at (305) 371-6000. For accidents in Broward County, such as Hollywood, Plantation, Weston, or Fort Lauderdale call (954) 845-0535. Were also available toll free at (877) 475-2905, or you can contact us directly by sending an email to info@gslawusa.com.